At the beginning of the 17th century a stronghold was built on the ruins of the Castle of the Barbarian Arrigo. Its function was to guard the entire valley of Perugia. In the following centuries the manor house of Castel Rigone and Pian di Marte was built here. Later this narrow and dark place, which was unassailable at that time, became a prosperous farm (in Italian: Fattoria) where nobles and counts stayed while spending their holidays in Umbria or passing through. The Grand Master (Gran Maestro dei Cavalieri), who loved one room in particular, also used to sleep here. Over the years different administrators followed one another until the 60s, when a young farm manager, who had already worked at the Castle of the Knights of Malta in Magione, was entrusted with the administration of the manor. His name was Aldo Pammelati and he grew so fond of this place that he refused to sell the manor house when entrusted with the sale of the entire estate. He sold all the lands but kept the manor house, which everybody called “La Fattoria”. Together with his diligent wife Lidia Castellani and later with their daughter Gabriella and their son Roberto, he turned the farm into the hotel you can see nowadays. Luckily, today nothing is left of the six dark rooms with a shared bathroom, but the atmosphere here is still the same. La Fattoria means modernity and comfort. At the same time, however, it reminds us of those personalities we didn’t have the opportunity to meet, but that we can feel closer just after one night at the Hotel La Fattoria. 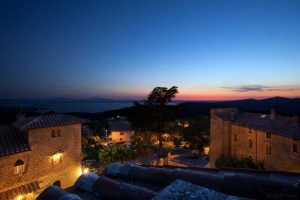 The medieval hamlet rises on the top of Monterone (in Central Apennines) that offers a breathtaking view of Lake Trasimeno thanks to its 650 meters above sea level. The village was founded in 543 AD by Totila and in 1297 it became a defensive bulwark of the city of Perugia against possible attacks by rival surrounding towns. The ancient “Ospedale dei Pellegrini” is one of the few medieval lazzaretti that came up to us in their original structure, a work of the first half of the 15th century by “Confraternita dei Disciplinati”. The simplicity of the sanctuary dedicated to the Madonna dei Miracoli is an important example of Renaissance art: the façade and the wonderful portal were designed by Domenico Bertini (an apprentice of Michelangelo). Inside you can admire a beautiful painting of the Virgin Mary. In the chapel “Oratorio del Santissimo Sacramento”, which is located to the left of the entrance of Relais La Fattoria, there is a large canvas representing “The Last Supper” painted by Silla Piccinini in 1598.